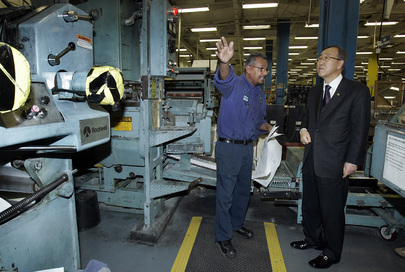 UNITED NATIONS, March 6 -- There was a buzz both angry and sad among staff at the UN on Friday, about the death of a printing worker who had a stroke the previous night in the third basement publishing plant. According to colleagues of his, it took nearly an hour for a New York City ambulance to be allowed into to attend to him. They offered to carry him themselves for treatment, but were told that they couldn't. Speaking to Inner City Press on condition on anonymity -- they expressed fear of retaliation even for disclosing this -- they described another situation slightly more than a year ago, in which a printing plant worker had his fingers crushed in a machine, and again the arrival of medical services was delayed. They questioned why, other than during the September to October General Assembly meeting period, there is not even a nurse on duty when they work the night shift. They said it makes them question the United Nations Organization and its commitment to the basic rights of its own line workers, despite its pronouncements about the right of others. "Imagine," one of the dead man's colleagues told Inner City Press, "we work on 42nd Street on the island of Manhattan and it takes an hour for an ambulance to reach us." What's worse in this situation is that a year ago, the same problem arose, and while a journalist died of a stroke on the UN's third floor, a New York Fire Department vehicle was stopped at the UN's gate from First Avenue. When Inner City Press reported on that story, the UN Spokesperson's office pushed back, denying the time line, implying it would not happen again. Now, according to UN printing plant staff, it has happened again. Where will accountability lie? Inner City Press: How long did it take and what is the policy of the UN on letting emergency medical personnel on the UN property? Associate Spokesperson Farhan Haq: First of all, there were emergency medical personnel on hand at the time. As I just mentioned, three UN security officers who are qualified EMTs performed CPR on Mr. Janitschek, and there was no sign of life at the time. A defibrillator was used to try to start his heart, to no avail, and appropriate medical protocols were followed. The person who was with Mr. Janitschek, Mr. Casella, your colleague, had immediately called the UN operator, who called security, who then called the emergency responders, including a direct call to New York hospital. The first responder was actually a fire engine truck. They were not allowed in, because they could not provide the level of care needed, compared to the trained EMTs, who were there on site already, the three UN security officers. An ambulance arrived 10 seconds later, and that ambulance and paramedics were let in directly. Like I said, all of that was to no avail, ultimately. Mr. Janitschek gave no sign of life throughout this process. Inner City Press: First of all, who decides whether to let in or not to let in a New York City fire truck? And what is the policy of the UN in terms of this? Does it automatically allow emergency or fire personnel without [searching or blocking them]? Associate Spokesperson: We have the protocol to call in emergency responders when there is an emergency in the building, and that protocol was followed. As far as checking vehicles that come in, that is a standard security procedure, but that did not result in any significant delay. Like I said, the ambulance and paramedics were let in directly. Editor's note: beyond that fact that several witnesses continue to describe the searching of the ambulance, no one has rebutted or even denied the 24 minute response time. In the UN's scripted statement at Friday's noon briefing, highlighted above, it is said that a fire truck was denied entry. A UN security officer after the briefing confirmed that when FDNY vehicles come to the UN, the policy is to not let them in unless there is / the UN is aware of a fire. There's a problem: FDNY took over EMS ambulances some time ago, and FDNY personnel are trained in the procedures which were needed that February 2008 night. So why have a policy that includes turning away official NYC emergency responders from the FDNY? Now, there's this event in March 2009. Watch this site.